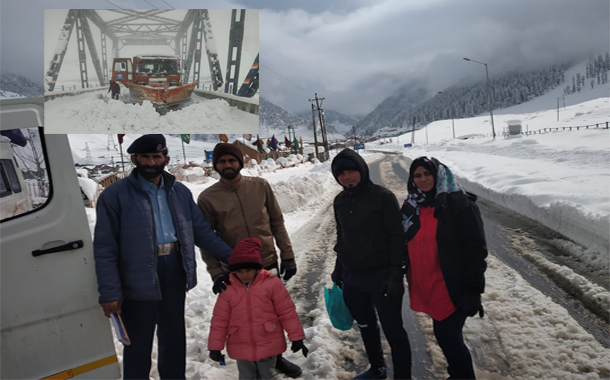 Sirinagar: The snowfall in Kashmir valley, Jammu and Kashmir Police Traffic Police on Sunday evacuated about 700 civilians from Jawhar Tunnel and Sonmarg who were stranded due to inclement weather and snowfall. Besides over 1000 civilians were provided food and shelter in Banihal by Police and civil administration. In the aftermath of snowfall, J& K police have deployed rescue teams across all affected areas of the state. At Ganderbal, a stranded Tempo vehicle in which 26 passengers were boarded was rescued and shifted to safer places. In last 24 hours, police in Kulgam rescued 700 stranded passengers from Jawahar Tunnel. 300 individuals were taken to Qazigund, 300 to Banihal and 100 to the CRPF establishments where they were provided all required assistance. Moreover, 600 were rescued from Banihal area who were accommodated at Nowgam and Gund area of Banihal where they were provided food, shelter, and accommodation for a night stay with the active support of the civil administration. Moreover, the police are on job to rescue two truck drivers namely Shamsher Singh and Ajit Singh who are trapped at Zero Point India Gate near Drass. 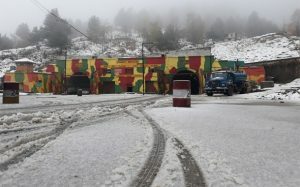 Following the season’s first snowfall in Srinagar, the summer capital of Jammu and Kashmir, the traffic movement on Srinagar Jammu highway, the only road connecting Kashmir valley to rest of the world has been suspended for the precautionary measure, while as the historic Mughal road was closed a day before. Similarly, the historic Mughal road was closed yesterday for movement of traffic due to snowfall at Peer ki Gali. The decision regarding allowing the movement of traffic on Mughal road shall be taken after the road is cleared off by concerned road maintenance agency and after assessing weather/road condition itself, the spokesman said.